For when 4 piston brakes will just not do the job, Zero/Sports has developed a 6 Piston Brake Caliper Kit track use. -Made of lightweight aluminum, the 6 Piston Brake kit will drastically increase braking power while substantially reducing the unsprung weight attached to the wheel hub. Each Zero/Sports 6 Piston Caliper weighs in at 7.5 pounds, that’s 2.5 pounds lighter than the 10 pound stock calipers. -The special heat dissipation characteristics of the Zero/Sports ZP-B brake pad make it possible to reach extremely high temperatures without losing braking efficiency. -The Zero/Sports ZP-B Brake Pads included with this kit are made of an asbestos-free ceramic-metallic compound with an optimal friction coefficient of 0.70 at rotor temperatures of 830 degrees Celsius. 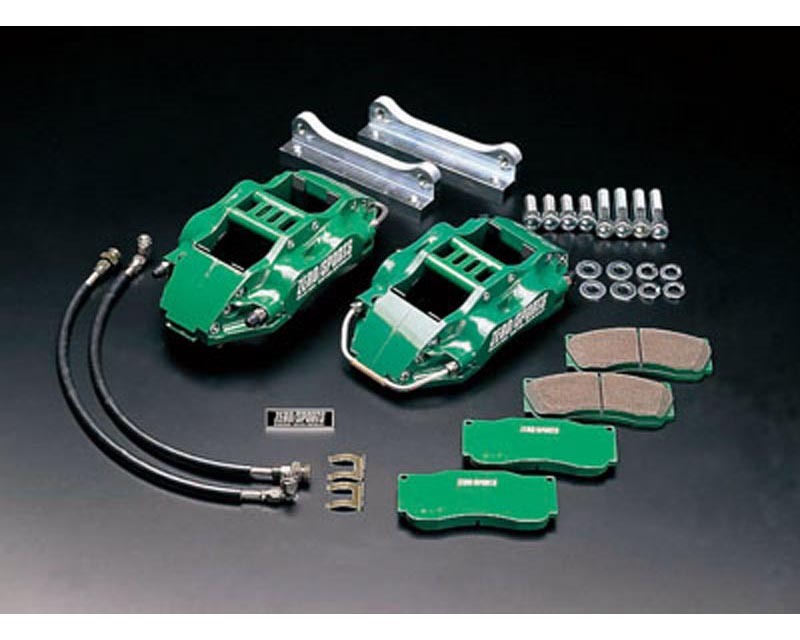 -It is recommended that you use Zero/Sports Sport, Circuit or ZP-B Brake Pads with this kit for your rear brakes.This kit contains the brake calipers, brake pads, brake rotors, brake hoses, mounting brackets and bolts. This is everything you will need to install the caliper kit.